An easy-to-knit texture pattern creates puffs which make these cowls squeeze-ably soft and warm. Interlocking diamonds are created in wide stripes of color with a Tuck Stitch knit into the stitch several rounds below the needle while releasing the stitches above. A reverse-stockinette edge rolls to the wrong side for a nice finished edge. 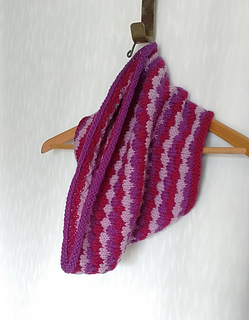 Cowls in two lengths are worked in the round with only one color at a time. Use three colors for stripes as I have here, change it up by using only one or two colors or make it multi-colored by using up your scraps. Sample made in King Cole Merino Blend DK; 115yds (104m)/1.76oz (50g) ball; 100% Pure New Wool; Color A – 1530 Crocus, Color B – 1765 Cerise, Color C – 1766 Orchid. Small cowl – 1 skein of each color. 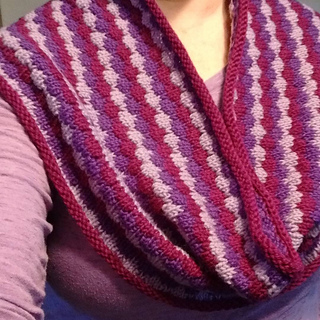 Large cowl – 2 skeins of each color (only a small amount of the second skein was used).